While deciding on our packaging, we knew we didn’t want to give you yet another box to add to your collection of unused jewelry boxes. At best, they remain at the bottom of a drawer or gather dust on a shelf. We discussed the fact that we all love to travel, and that it would be excellent to have a minimal, yet stylish way to protect the jewelry. We worked together with a local LA artisan to create the stôn pouch. 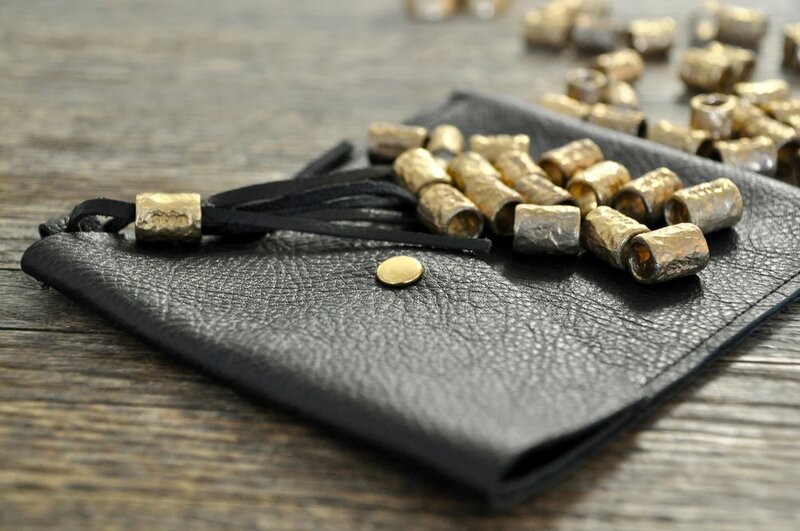 Each stôn piece comes with a handmade, black leather pouch. The leather used is repurposed, so each one is slightly different, much like our jewelry. The iconic stôn bead was cast in bronze, hand finished and attached to the tassel. We knew the pouch had to be able to fit quite a bit of jewelry to take on our adventures. We also needed the pouch to be functional and multipurpose. We wanted to be able to use this pouch as we dashed to lunch or for an evening out. It needed to be able to hold the essentials: phone, cards, ID, and maybe even a set of keys. What’s going inside your stôn pouch this weekend and where are you headed?